Nowadays, there are many types of dental sedation that are offered to make dental treatments more comfortable. Sometimes sedation is required for a procedure and other times, it can be offered if a patient is suffering from extreme anxiety or dental phobia. Knowing the type of sedation that will work best for you is dependent upon the procedure you are having and the amount of consciousness you want to experience. There are four types of sedation that dentists generally use in their practices. All four of these methods will give you different levels of sedation ranging from light to deep. These are inhaled minimal sedation, oral sedation, IV moderate sedation, and deep sedation via general anesthesia. The first type of sedation, inhalation sedation, is the lightest kind of sedation. This type of sedation will help to relax you without completely rendering you unconscious. Because it is such a light form of sedation, the effects will wear off soon after you stop receiving the sedation and you will most likely be able to drive upon completion of the procedure. Inhalation sedation is delivered through a mask that fits over your mouth and nose. 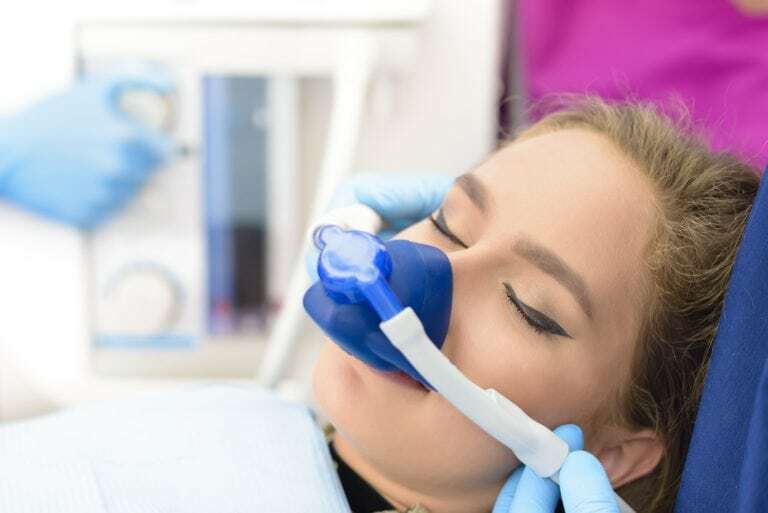 This type of sedation is most commonly known as “laughing gas”, but is scientifically known as nitrous oxide. Nitrous oxide is a colorless, odorless gas that will reach the brain twenty seconds after inhalation and will start affecting pain receptors two to three minutes after inhalation. Another method of sedation is oral sedation. Oral sedation can achieve a minimal or moderate level of sedation depending on the size and type of dose. When a more moderate level of sedation is used, oral sedation will make you feel drowsy and may even cause you to fall asleep. However, this type of sedation allows you to be easily awakened and you are not truly unconscious. Oral sedation is usually delivered through the ingestion of a Halcion pill an hour before the procedure is to begin. Because this type of sedation offers minimal to moderate sedation that is achieved through simply swallowing a pill, oral sedation is one of the most popular dental sedation methods available. The next sedation method is IV moderate sedation. This type of sedation achieves a moderate level of sedation, making you drowsy and lingering on partial unconsciousness. It is delivered through the vein, so the effects of this sedation are instant and can be appropriately regulated throughout the procedure to obtain various levels of sedation as needed. The final method of sedation is general anesthesia. This is the deepest type sedation available to dentists and is used only when absolutely necessary. General anesthesia will put you into a deep sleep and will render you completely unconscious until either the effects of anesthesia wear off or medicine is given to reverse the effects. Ultimately, the type of sedation will depend on the procedure you are having and your individual needs. It is important to discuss your procedure and your sedation options with your dentist to find the option that works best for you.